If you’ve been following along, we are diving into designing instructional sequences (aka lesson plans) using the 5E Model. Engage, Explore, and now EXPLAIN. And let me say, if you are only going to read ONE of these posts, this is the one to read! Most teachers approach implementing the new science standards using the same approaches they always have. Unfortunately, this will NOT work if your aim is to truly transform your instruction. The Next Generation Science Standards were literally designed to CHANGE the way we teach science. If you’re just shifting your content without shifting your strategies, you’re missing the point. So what is the point? The point is for students to develop their own understanding of science content through the learning experiences and opportunities you offer to them. Engage and Explore are vital to that process. They catch students’ attention and begin breaking down inaccurate understandings. But Explain is where everything comes back together. It’s where the meaning-making happens. But it’s also where teachers get sucked back into their old ways of “doing science.” Even the biggest curriculum developers struggle with the intent of this phase — as evidenced by the slideshows, notes, and videos that make up the entirety of the “Explain” activities in 5E lesson plans. So what is Explain really about? The purpose of Explain is for students to make sense of what they observed and experienced during Engage and Explore. Its ultimate goal is for students to develop an improved understanding of the phenomenon or concept. In this phase, students provide explanations of what they experienced during Explore. Then, and only after students have had the opportunity to share their own explanations, teachers chime in with their additional information. But really, the more you can draw out these explanations from the students, the better off you’ll be. Your Explain phase is always going to begin with the teacher asking students to share their explanations in some form or another. The teacher may bring attention to specific parts of the Engage or Explore activities, providing specific examples to support or challenge student ideas. The goal is to help them make meaning themselves of what they experienced. Likewise, students should take the opportunity to do the same. Students should respond to their peer’s explanations, whether by supporting and expanding on their ideas or by challenging them. This discourse is vital in the Explain phase. When the class appears to have reached consensus on an explanation, and as the teacher you have guided them toward an accurate understanding through your questions and observations, only then is it appropriate to begin introducing the scientific explanations and terminology. At this point, students have agreed more or less on an explanation of the phenomena. Your job is to essentially repeat that explanation back to them, using the appropriate science concepts and terms in a clear and succinct manner. Let me emphasize though, ideally you are using THEIR explanation and examples! This initial discussion is a key part of the Explain phase, and it really helps transition the Explore into the Explain. In fact, the first part of Explain isn’t really an activity at all, but rather a wrap up or review of the Explore activities. That said, just because I used the term review, please don’t get tripped up thinking it’s a “Check your answers!” type of things. Again, the goal is discussion — not correction. After your initial discussion, students can move into learning experiences that explain the concepts they have observed in more scientific terms. For example, during a condensation Explore lab, the class reaches the consensus that water in the air creates the droplets on the side of the cup when it cools. In your Explain activity, they might watch a video that explains the process using the terms water vapor and condensation. While teachers often use lectures and PowerPoints to present information in the Explain phase — which is absolutely acceptable here in the second part, provided you are really just adding the scientific terminology to student ideas — there are other approaches as well. Incorporating videos, web and computer-based simulations, or texts all work well. If you aren’t ready to join our tribe but would like to learn more about the 5E Model, check out my full workshop, “Designing NGSS Aligned Instruction,” available with resources at TeachersPayTeachers. 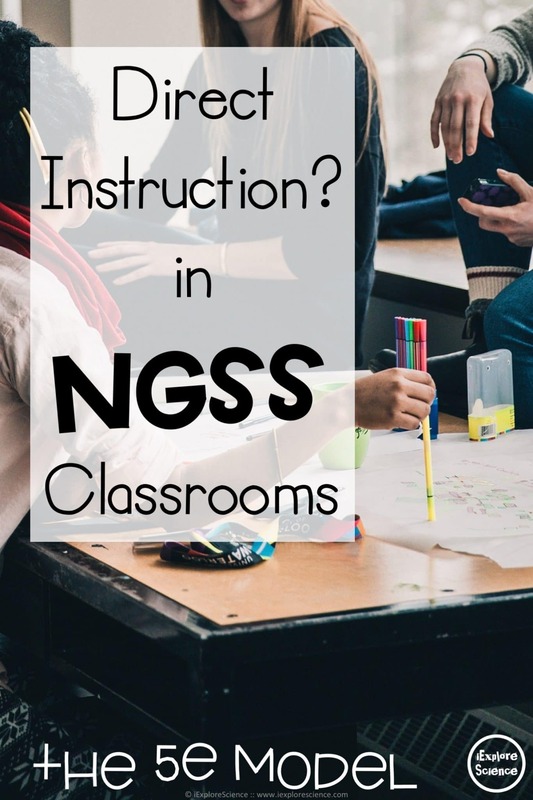 Adopting the NGSS isn't about changing your content. It's about changing the way you teach. Learn more with iExploreScience and claim your free Data Analysis Strategy Guide to start implementing the Science and Engineering Practices today.